Last night we had a popcorn tasting. This came about because I was sampling recipes for take-alongs, which are in full bloom these days. As I was shaking my pot and minding the popper, I thought, what a cool idea for a party! Why? Well, popcorn is super cheap. I bought a 4 pound bag of kernels for about 3 bucks. Five pounds of un-popped popcorn makes....well, have you every seen the movie Real Genius? Okay, not that much, but still. 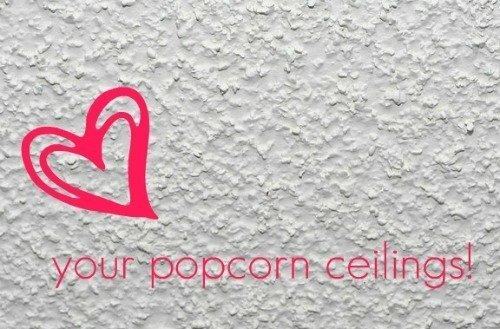 How to remove a popcorn ceiling. Store-bought microwave popcorn is kinda nasty: it tastes processed, gritty, and generally nothing like popcorn. Plus, when you can make your own, it becomes overpriced, and unnecessary. When one doesn’t have the time during a commercial break to stand in front of the stove shaking for seven or eight minutes, DIY microwave popcorn is a totally usable alternative that puts that toxic, yellow sludge-covered stuff to shame.